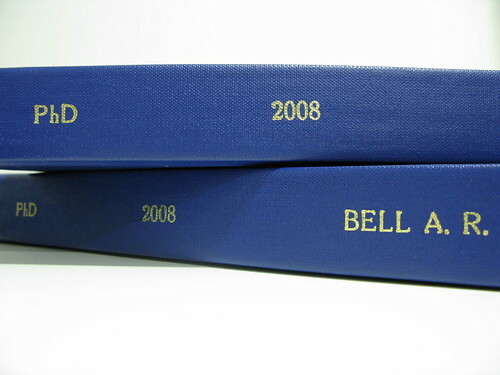 I submitted my PhD thesis in Summer 2008 and am more than a little ashamed that it’s taken me this long to put it up here. There are lots of reasons for this. Mainly (a) Laziness. (b) A post-PhD feeling of “Oh this is crap. I have to hide it, and possibly myself, under the largest stone I can find so no one will see how stupid and useless I am”. It’s also because I was expected to try and get it published as a monograph – bound book in an exclusive handful of libraries – and opening it for anyone to see might compromise the chances of that. The main reason I haven’t sought publication that way isn’t (a) or (b), but simply because I think that it seems so ridiculously outdated and elitist a way to share anything. Yes, publishing it as a book would give it a good edit (though we all know people who simply went Ctrl-F “this thesis”, replace all “this book”) but really, I think I’d get better feedback generated by more people being able to see it. That provides a less-polished product, but overall it’s a greater win for scholarship. I’ve thought this for a long time, I’ve (perhaps stupidly) said so in interviews. It really is just laziness and lack of confidence that has stopped me putting it up here. So here is it (links to google drive pdf), or at least an image-free version as the full file would be huge and also involves other people’s copyrights than my own. It’s a literary study of the Horrible Science books, in the sociological context of why and how adults write about science for children. Full title: Science as Pantomime: Explorations in Contemporary Children’s Non-Fiction Books. Conducted at Imperial College (2004-8), funded by the AHRC, supervised by Felicity Mellor and examined by David Buckingham and Peter Broks. I’ve included it and more in an updated version of this blog’s “writing” page. Honestly, I think a lot of my academic work is pretty rubbish. Forcing myself to open it up will, I hope, make me make it better. I can also say that I’ve not published that much since I finished my PhD. This is partly because up until last November when I moved to Sussex, I’ve been employed to teach and do public engagment work, not research. It’s also because knowing that your writing is inaccessible to most of the more interesting people who might read it really isn’t much of an incentive. We badly need to fix this system. I’m paid to write, but also paid to keep it this writing hidden. It’s stupid. This entry was posted in media studies, science and tagged kids books, media studies, popular science, publications, science and technology studies on January 14, 2013 by alice. 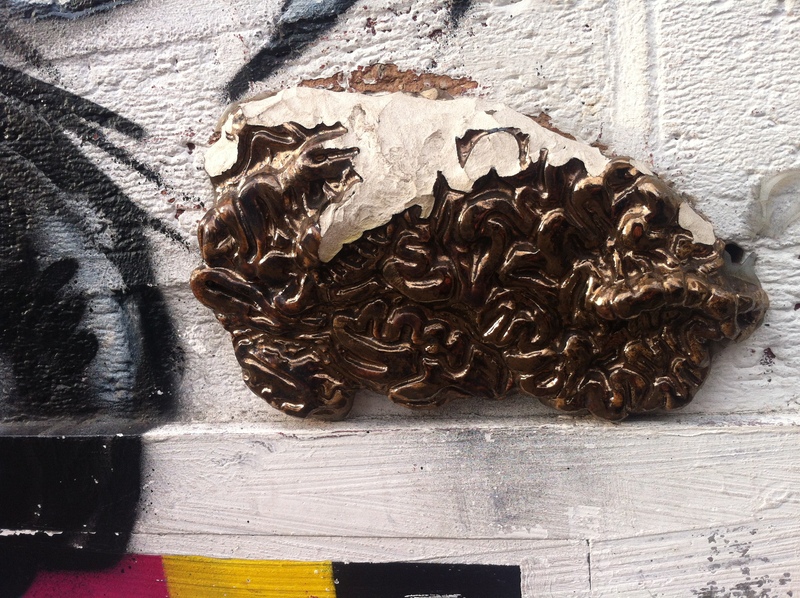 A bit of brain-y street art, Shoreditch, London. A while ago, I started some research into people who blog about the brain, in particular the ways they see their audiences Sadly, changes in jobs meant I didn’t have time to develop that particular research interest (and I mean sadly, because this study only strengthened my belief that science bloggers are fascinating, for all sorts of reasons). However, I wrote up my preliminary notes for the Canadian Journal of Media Studies, and you can read it here (download pdf, no paywall). The abstract follows, though please note (ht to Bora Zivkovic) the disjunction between speed of changes in science blogging and the slowness of scholarly publishing means some of the links don’t currently work. A bit of googling should get you round this, as usually it’s a case that blogs have moved but individual posts have kept the same titles and datestamp. “ScienceBlogs is a high school clique, Nature Network is a private club”: Imagining the audiences of online science. This paper is the result of preliminary research on science bloggers, with a focus on how science bloggers view their audiences, the community they sit within and their personal social identity within that. It starts with some broad background on science blogging, in particular the ways in which science bloggers seem to congregate around networks, their concerns over seeming exclusive, and they ways they may actively attempt to either maintain or blur boundaries around the social identity of scientist, journalist and blogger. I then move onto more detailed work on people who blog about the brain, offering some rough work-in-progress results of a small survey study. From this early analysis, it seems that an idea of an audience is important to many science bloggers, although they are not necessarily all that sure of the specific make up of this audience. Moreover, it seems that science bloggers see their audiences not simply as a recipient of scientific knowledge, but a potential resource, and as blogging as being part of an ongoing diverse conversation. As this is the first stage of analysis, I finish with some notes on how I see the next stage of this work. This entry was posted in blogging, brains, media studies and tagged bloggers, brains, engagement, journalism, media studies, science on November 16, 2012 by alice. George Bush used to say, in his generous way, that the science [of climate change] is uncertain. But it’s an almost content free statement because science is about uncertainty. Lord Oxburgh FRS, Imperial College, 30th January 2012. That quote comes from a debate on climate science in the mass media we held at Imperial last week, part of the pilot science in context course I’m working on. You can find a podcast of the debate at the college media site. Oxburgh chaired the event, with a panel comprising of Louise Gray (Environment Correspondent, Telegraph), James Randerson (Environment and Science News Editor, Guardian), James Painter (Reuters Institute, University of Oxford) and Joe Smith (Open University), along with questions from our undergraduates. A couple of students and tutors later told me they felt the panelists were too similar, that there wasn’t enough ‘debate’ and they’d have liked to see a climate sceptic. I take that point, but also disagree with it. There was, if you listen carefully, a fair bit of diversity within the discussion. It wasn’t one side vs. the other, and just because the panellists tended to be polite and smile and nod at each other didn’t mean they were all coming from the same position. It’s worth reflecting on how we identify a ‘debate’ here. Debates do not always have to be a battle of two opposing views. Personally, I’d say that’s often the least productive sort of debate you can have. They can also just be a group of people playing with a particular issue; a matter of chatting to gradually identify problems and reflect on possible answers. Indeed, this question of how we structure and spot the debate within climate science was a key topic of this particular event, as it was in our previous class, with Brian Hoskins. James Painter started things off by stressing there are many types of uncertainty involved in the public discussion of climate change, including many types of scepticism: ‘there are many ways you can question and be uncertain about climate science’. Drawing on his Poles Apart report, he suggested four types: people who are sceptical that global warming is happening, those who a sceptical that it is due to human action, those who are sceptical about aspects of climate change’s impact and people who are sceptical about specific policies. James Randerson followed with a different track, noting the stretch of the issue with reference to an extraordinary letter to the Guardian from the medical community, calling for more transparently on climate lobbyists. Louise Gray offered another topical case study: the diversity of coverage of a recent UK government report on the impacts of climate change to the UK: the Guardian focused on the burden to poor where as the Telegraph noted possible opportunities for the tourist industry (you can google for yourself to see what the Mail said). As Gray argued, newspapers will have different frames for how they read climate news based on the editors’ ideas of their customers, a point underlined by Joe Smith later when he stressed the way we all bring our own cultural ‘baggage’ to climate change debates, and plugging Mike Hulme’s book, Why We Disagree About Climate Change. 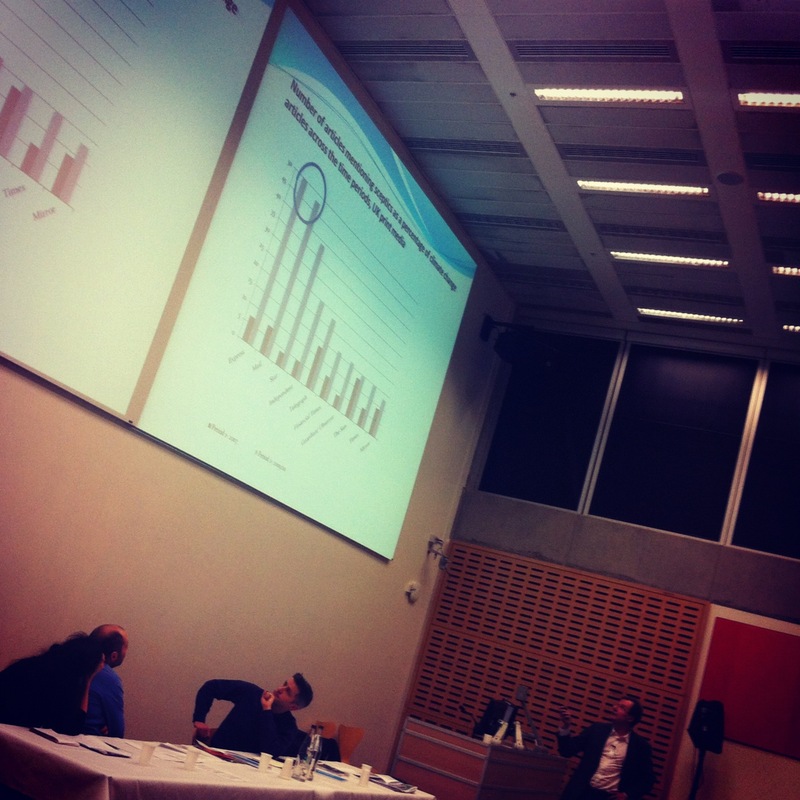 For his presentation, Joe Smith argued that in many ways climate science makes for a rubbish story in the mass media. There is simply too much of a consensus: too many of the experts agree, what really is there to report? He said he used to think the consensus on climate change was a good thing, but it does make it unreportably dull, which is why the contrarian views get pulled in, to liven it up. There isn’t enough of an edge, maybe we need more of an edge? Gray echoed this in discussion, saying we should pay attention to more of the ‘dodgy things’ going on around climate change – subsidies, inefficiencies of NGOs – that the real stories are less about sceptic vs non-sceptic and more about who is doing the right thing, how and when. Randerson and Oxburgh seemed slightly more cautious of Smith’s call for more arguments, laughing ‘careful what you wish for’ and noting the ways a stronger sense of disagreement plays in the US and Australia. I wonder if that misses Smith and Gray’s point though, which to me was more of a call to open up the political edginess of climate change policy. It was about the disagreements at the end of Painter’s typology of sceptics: debate over what to do about climate change, not whether it is happening or why. For me, this was summed up in a comment from Gray near the end of the evening: ‘there’s a lot of heat and fire around a few sceptical people, but maybe that is the wrong focus’. This entry was posted in environmentalscience, events, journalism, media, media studies, policy and tagged climate science, horizons, journalism, media, media studies, policy on February 6, 2012 by alice. Context context context. It’s what the mainstream media’s reporting on science always lacks, isn’t it? It’s the oft-repeated line ‘I think you’ll find it’s a bit more complicated than that’ which media critics such as myself can grump about from the cosiness of their ivory tower. Context context context: Easy to say, but hard to provide? Context context context: Easy to say. For example, our content analysis for the BBC Trust’s review of impartiality and accuracy in science coverage (blogged about earlier this week) highlighted quite hand-waving descriptions of scientists’ roles and work, with a reliance on phrases such as ‘scientists have found’ and ‘experts say’. We also noted little exploration of experimental design, and that it was very rare that the funder of research was referred to. We worried that many reports relied on a single viewpoint or paraphrased alternative views, and the lack of explicit reference as to whether or not a contributor was involved in the research being reported (i.e. independence was hard to judge). Context context context: Hard to provide? A journalist can easily, and quite fairly, reply to calls for more context with the argument that readers do not care. Of course the big wide world is more complex than depicted in the mass media, but a large part of a journalist’s job is to simplify this world, and that inevitably means losing some context. Personally, I think there are still ways journalists might rethink the traditional patterns for telling stories, and I expect professional journalists of the calibre working at the BBC to be imaginative and thoughtful about what parts of stories they choose to provide (and I know the good ones do, and that they are constrained in a lot of their work too). One of the things we coded for in the study was if a piece pointed the audience to other information: the chance for people to find out more if they wanted to. This didn’t have to be online links, but would often be. We noticed it was rare that the broadcast news items ever explicitly directed viewers to the BBC website for further information about science items. In the online news, there were automatically generated links to other BBC reports on similar topics, but only 21 items (16%) included links to other BBC reports within the body of the text. However, almost 90% of online news items included at least one link to the source of the story, such as the laboratory where the research was carried out or the journal where it was published, but 70 items (54%) included no links to other external sources. So, over half of online news items the reader is not offered opportunities to find further information relevant to a science story other than that provided by the source. Blogs in particular offer the opportunity of linking to other sources and, by enabling journalists to “show their working”, may help make visible the process of reporting too. Some of the BBC reporters’ blogs we looked at made use of this, particularly those of Jonathan Amos and Richard Black, but only one of Tom Feilden’s blogposts in our sample period contained any in-text links to sites other than the Today programme. Blogs also allow journalists to post longer quotes from sources than the edited versions included in broadcast reports, include links to other sources of information that the journalist has used to build their story, or track unfolding stories (as with the Guardian’s Science Story Tracker). However, we found few examples of this type of usage in the BBC blogs we looked at. Like much of the content we looked at, blogs were more likely to mention benefits of scientific research than risks (eleven of the 27 unique postings cited benefits compared to just two mentioning risks). It seemed to us that as with a lot of the online science content (and science content overall), the blogs located science as a ‘good-news’ story where science provides benefits to society and is rarely the source of any risks. As with any of this, you may well be able to dig up an example or three to argue that the BBC blogs are ‘anti-science’ in some way (and this singular examples may well be very important, perhaps even because they are singular) but looking at our sample as a whole, this was not the picture we saw. We saw a range of ways of using the blogging form amongst the science and technology reporters that blog for the BBC. Some reporters took the chance to contextualise news stories they have reported on (Richard Black), or to offer a more personal take on a story (Fergus Walsh). Others would trail upcoming items (Susan Watts), to summarise/ repeat a news item in another site, or describe related research (Tom Feilden, Jonathan Amos). Potentially, adopting a personal voice raises issues with respect to the BBC’s impartiality (there are editorial guidelines on this), although we found no evidence in the blogs we looked that it had actually compromised impartiality in action. If anything blogs can also offer a space to address questions of impartiality and accuracy when they arise though. We found a lovely example of this from Rory Cellan-Jones, where he reflected on an report for the BBC One News at Ten, saying he should have been he should have taken a more sceptical tone, and also took the chance to quote at length the scientist’s defence of the research. You can find more details of this study in the full report (opens as pdf) especially pages 33-38. As I’ve written before, the placing of a link is a rhetorical and, as such, creative process. Thinking about what you’ll link to, how and when (and when not to) is a challenge I personally adore when I write, and one of the many reasons I find writing online more professionally fulfilling than print. It really doesn’t seem to be used enough though, or thought about as much as it could be either (n.b. this is a general grumble, broader and looser than the BBC Trust study). So, I guess for now I’ll keep banging on about ‘context, context, context’, knowing it’s hard for journalists to provide it but hoping they continue to try to be as imaginative and proactive as possible in facilitating connections between the information that is out there and those members of their audience who are interested to find out more. This entry was posted in blogging, journalism, media studies, web and tagged blogging, journalism, media studies, publication, web on July 29, 2011 by alice. EDIT, July 2012: Slightly updated version for Open Democracy. Last week the BBC Trust published their review of impartiality and accuracy in science coverage. This included research undertaken by my group at Imperial. My name’s on the front but I should stress that I only did a small part of the work. It was lead by my colleague Felicity Mellor. This post isn’t in any way an extension of the report, or official comment in any way: it’s just some of my thoughts on a small part of it, a few days after publication. Please also note that I’m talking about our report (pdf) which is Appendix A of the full review. It’s also worth flagging up that it was a content analysis, and these can only tell you so much. A focus on content can lose the context of the making of the news, as well as its reception (something I think came out well in the recent debate between Ben Goldacre and James Randerson). However, studies like these can also flag up some fascinating points for further thought/ analysis, and challenge the sorts of assumptions we all make through our own everyday personal (and partial) consumption of the media. It all too easy to get annoyed by a bad example and generalise from that, a systematic content analysis can provide a more nuanced picture. A lot of the news coverage of the review has focused on so-called ‘false balance’; the perceived problem of giving too much weight to fringe views in an (arguably misguided) attempt to avoid pushing one particular point of view. Just as a political piece might ‘balance’ itself with perspectives from left and right wings, a science story might, for example, include someone who is against vaccinations as well as someone who would advocate them. If you are interested in balance issue with respect to climate change, chapter three of Matt Nisbet’s Climate Shift report makes for interesting reading. I’d also add that Hargreaves and Lewis’ 2003 Towards a Better Map report on science news gives some historical context to the UK’s particular issues with respect to balance, in particular the way BSE led to framings of MMR (which one might argue, in turn, influences reporting of climate). Our study was based on a slightly more diverse set of questions than simply balance though, as we tried to gain a detailed empirical grip on these slippery issues of impartially and accuracy. As a result, I think it threw up a rather more complex set of challenges too. One of the key questions our work asked was who is given a voice in science news? What’s their expertise, where do they come from and – arguably most importantly – what are we told about this sort of context? For a start, less than 10% of broadcast items in our sample included comment from those presented as having no specialist professional knowledge of relevance to the issue. Moreover, lay voices tended not to be run alongside expertise voices. So, that oft-made complaint that news reports rely on personal anecdote? Well, going by our sample, for the BBC this would not appear to be the case. It’s also worth noting that almost two thirds of the broadcast news sample – which included a lot of very short summary items – either relied on a single viewpoint or paraphrased alternative views. In items reporting on new research, this proportion rose to about 70%. So there was little room for alternative view here; to ‘balance’ or otherwise. I also thought it was significant that only about an eighth of broadcast news items about research, and almost two fifths of online news items about research, included comment from independent scientists (i.e. with no connection to the research being reported). Whether you think any these various expert voices (when they were included) are the right ones is another matter though. You can’t just say scientists are the appropriate voices and that’s it. Simply being ‘a scientist’ doesn’t necessarily make you an expert on the topic at hand, and there are other areas of relevant expertise, especially when it comes to science policy issues. We had to think a lot about the rather large ‘other professional expertise’ category we considered alongside scientific, clinical, lay, non-science academics and ‘unknown’. Other forms of professional expertise came from politicians, spokespeople for charities and representatives of industry. It’s important these experts are included in debate about science. For example, a scientist might be able to talk about their research, but know little about the policy surrounding it. Equally though, many scientists do have expertise of such areas as part of their research. It depends, which is rather the point about ‘a scientist’ being too blunt a description. We did notice a relative lack of direct comment from the UK government (less than 2% of items) as part of science stories, something I think is potencially worrying in terms of public debate over science policy. Aside from questions over appropriateness of expertise being a rather slippery issue, there is very little information given about the expertise of a speaker. We found lot of reliance on phrases such as ‘scientists have found’ and ‘experts say’. Personally I think we need to address this issue before we can even get on to matters of whether experts are the right ones or not. Although expertise may be implied through editing, and TV in particular can flag up institutional association and title, we rarely saw a contributor’s disciplinary background specified. Especially significant I thought, in broadcast reports about new research we found little explicit reference to whether or not a particular contributor was involved in the research being reported (online reports often refer to someone as ‘lead author’ or ‘co-author’). This lack of definition makes it hard for audiences to judge a contributor’s independence, whether they are speaking on a topic they have studied in depth or if they are simply working from anecdote. (I do appreciate how hard it is to give this sort of context, but it’s still a problem). One of the things I was personally excited to find out in the study was the institutional location of the voices of science. We found that they were twice as likely to be affiliated to universities as any other type of organisations. There are perhaps also questions to be raised about the geographical distribution of these. Cue headlines suggesting Welsh science is ‘frozen out’ by the BBC, but the dominance of researchers based in the South East of England might be a due to a range of other factors (e.g. concentration of ‘Russell Group’ universities there). When it came to coverage of recently published research, it was also interesting to ask which publications they came from. Nature, the Lancet and the British Medical Journal accounted for nearly all journal citations in the broadcast news. As with the location of research institutions, this is perhaps understandable considering their status, but also lacks diversity. On the reliance of particular journals, Charlie Petit was quick to note how little the American journal, Science is mentioned compared to the British equivalent, Nature. We thought this was interesting too, and wondered if this was a UK bias issue, but seeing as we found more coverage from Science when it came to online and non-news samples, it could be simply be that Science‘s embargo times don’t fit so easily with the BBC’s broadcast news schedule. If you combine the arguable lack of diversity of news sources with our concerns over the reliance on press releases it is tempting to think back to Andy Williams’ point, based on his Mapping the Field study, about the ‘low hanging fruit’ of the almost ready-made content the highly professional press teams at these elite publications and research institutions push out. It’s hard to tell the reasons for this sort of coverage from our content analysis though. These sorts of questions, I believe, require studies which consider the processes of news-making as well as the content (and while I’m talking about Cardiff research, I should flag up the great iterative and mixed methods approach taken by Chimba and Kitzinger in their Bimbo or Boffin work; inspiring bit of research strategy there). Anyway, I hope that’s pulled a bit more out of the study, but it’s only scratching the surface. There is, obviously, a lot more in the report itself – do read it for yourself if you’re interested in science journalism. If I get time later in the week, I’ll do a follow up post on what we had to say about the BBC’s blogs (edited to add 29/7 done!). There’s also a great interview with Dr Mellor on the Imperial College site which runs through some of the key findings. Edited to add 27/7: and a sharp editorial in Research Fortnight about it too. Edited to add 18/8: and here I am on the college podcast. This entry was posted in journalism, media studies, publication, research blogging and tagged journalism, media studies, publication on July 26, 2011 by alice. 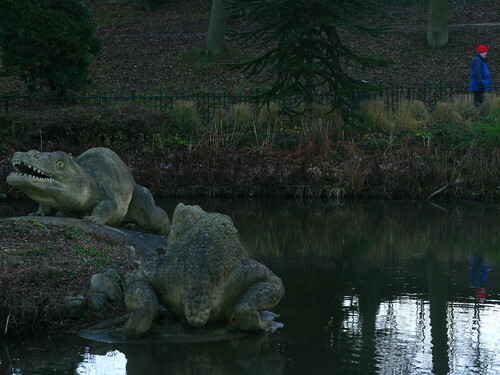 Dinosaur model from the 19thC, still on display in a South London park. Verisimilitude. Good word, isn’t it? It’s one of my favourites. It means ‘the appearance of being true or real’. It’s not just a term for people who study semiotics: philosophers of science use it too (or at least Popper does), as a way comparing theories’ claims to closeness to truth. It’s more ‘truthlikeness’, than truthiness, but has a range of uses and applications, many of which get somewhat intermingled when it comes to actually putting science to work in society at large. Top tip: After much swearing at my laptop while writing up my PhD thesis, I discovered typing verysimilartude into Word gets you the correct spelling prompt. This is a slightly abstract way of introducing a great new book I’ve just finished reading: David Kirby’s Lab Coats in Hollywood. The book is the product of several years of Kirby’s sociological research uncovering the backstage role some scientists play in the film industry, as consultants on the depiction of scientists and scientific ideas on screen. Kirby also seems to love the word verisimilitude, and the occasional messiness of its uses. It’s even on the dust-jacket. But this isn’t an esoteric tome of jargon-filled social science. It’s a neat little book for a generally interested reader; direct, clear, thoughtful and communicated with a genuine interest in the people it studies. Although the bulk of his examples are films of the last decade or so, in some respects, there is a long history to this sort of work. Kirby refers to my favourite example here: the Crystal Palace dinosaurs (pictured). In particular, the way Richard Owen, back in the 1850s, jumped at the chance to be the scientific advisor, so these models would match his ideas of what they looked like, not those of his rival, Gideon Mandell (Kirby, 2011: 15-16). As Kirby stresses, the construction of a movie is a very complex business, one which involves a huge number of specialists and has some rather unequal power structures. Arguably, Owen had more clout over the Crystal Palace dinosaur models than the scientists involved in the Jurassic Park films did. A scientific consultant may well be listened to at times, and in places within the making of a film, and then later ignored. Indeed, in some respects it’s an odd fluke that any films have scientific consultants at all, and there is no standardised method for integrating them into the film-making process (Kirby, 2011: 42-3). It’d be wrong to think of film-makers as dismissive of a scientist’s point of view though. They wouldn’t invite them on set in the first place if so. Indeed, one of the key points Kirby makes is how important a scientist’s version of verisimilitude is to the film industry. The book has loads of examples of this (seriously, the number of films that have used advisors might surprise you) but my favorite example is Finding Nemo‘s missing kelp. As Kirby tells it, marine biologist Mike Graham was asked by the animators if there was one thing in the film that might disturb him, what would it be. Graham replied that he’d hate to see kelp in a coral reef (it only grows in cold waters). There was an uncomfortable shuffling in the audience. But go check your DVD: there is no kelp in Finding Nemo. Each frond was carefully removed, at a considerable cost (Kirby, 2011: 102-3). Even films which sell themselves on fantasy (e.g. talking fish) rely on a certain sense of reality too: they need to be credible even in their love of the incredible, and science can help them do this. There’s a lot film-makers can find inspiring in scientific research too; a lot of visual beauty and novel ideas, a lot to make people go ‘wow’. That’s all good material for movie-making. Kirby has a lovely example of a visual used in the 2009 Star Trek movie, inspired by input from astronomer Carolyn Porto (Kirby, 2011: 12). Kirby also stresses how it important the verisimilitude of films is to scientists, something you can see very well from the fact that remuneration is not simply financial, and often relates to their work. Some do get paid for their work. Some feel this as inappropriate and so take alternative payment like tickets to premiers, some ask for funding for research programmes. Some see it as part of their responsibility to the public understanding of science, some want to promote their ideas, or see them realised with movie-technology, some find it simply fun (Kirby, 2011: 56-63). The National Academy of Sciences has a project to connect scientists and engineers with professionals in the entertainment industry ‘to create a synergy between accurate science and engaging storylines in both film and TV’. Personally I’m not entirely sure if this is a constructive approach to the perceived ‘problem’ of science in fiction or a giant red herring compared to less showy education and public engagement work (? genuine question mark here, I don’t know. Kirby refers to audience research, but conclusions and comparisons are very hard to draw here), though it may well make professional scientists feel a bit happier; to let off a bit of steam. Kirby has some constructive advice for anyone who does want to try promoting science through Hollywood: worry less about how you might make the science in entertainment products more accurate, and more about showing filmmakers that accurate science could actually make their film better (Kirby, 2011: 10). Other advice for scientists include get involved early on, and respect the filmmakers’ expertise too. Kirby further invites the reader to think about what scientific accuracy might mean within the necessary shortcuts and sometimes fantastical contexts of the film business. Yeah, there’s Finding Nemo‘s coral, but there’s also Brian Cox’s role in Sunshine, a scientific consultant who was brought in to talk to actors about a scientist’s psychological motivations as much as scientific ideas (Kirby, 2011: 71, 73). Those wanting to have an impact on the public discourse about science through movies would do well to think beyond a narrow sense of ‘scientific literacy’. As Kirby stresses in his conclusion, based on what we know from the fossil record, the representation of Dilophosaurus in Jurassic Park is completely inaccurate, but the film had much greater public impact (for good or bad) in terms of its depiction of scientists as heroes, as paleontology as exciting, and as genetic engineering as potentially dangerous (Kirby, 2011: 230). I’ve been recommending Kirby’s research to students for years (links on his site), and I’m glad I can now recommend a whole book to a much wider audience too. If you are interested in the politics of science fiction, some of the oddities of the film industry, scientific accuracy in popular science or simply an interesting mix of cultures, it’s worth a read. This entry was posted in books, fiction, films, media studies, science, scientists, sociology and tagged books, fiction, films, media studies, science, scientists, sociology on May 31, 2011 by alice. 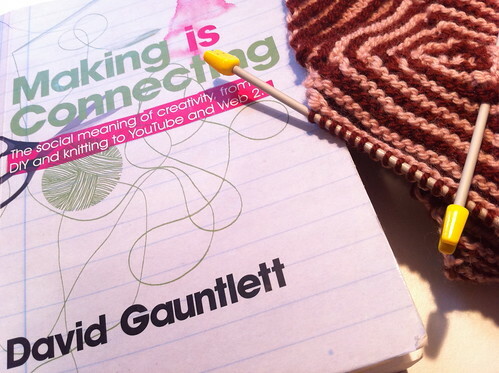 I’ve mentioned David Gauntlett’s new book, Making is Connecting, a few times recently: on my work blog, my knitting one, and on the Guardian’s Notes and Theories. It’s an interesting book worth talking about. It’s about the social meanings of creativity and 21st century maker cultures, be these makers of blogs, woolly cardigans, cupcakes, podcasts or physics-themed lolcats, and in particular the changing structures of making which surround what is sometimes called ‘social media’. As any seasoned media studies scholar will grump at you, all media is social, but with this thing we call web 2.0 the patterns of sociability are changing (Gauntlett has made a lovely vid on this) in ways which are wrapped up in the history of crafting. It has, however, taken me a while to actually finish reading the book and post this review. This isn’t because it’s a hard read, or boring. Quite the opposite. For a piece of social sciences, it’s incredibly well written. Still, in a way, it is a book that inspires slow reading, because one of the many reasons why it took me so long to finish (why it takes me so long to finish most books, unless I make myself sit and read them in a go, or even watch a movie or er… finish this sentence) is that I get distracted. I stop consuming whatever other people have made – in this case Gauntlett’s book – and go and produce something for myself. I knitted, I cooked, I wrote, I gave lectures and organised events. Some of this I did myself, some of it collaboratively. Along the way, I also found stuff other people had made to consume and take part in too. And that’s why Making is Connecting might be ‘slow reading’. Because, this process of going off and doing something yourself is a lot of what the book is about. One of the key frames of the book is a shift from the passivity of the ‘sit back’ model of what might come to be seen as the odd mid to late 20th century era of the television and towards a culture dominated by ideas of making and doing. People who watched British television at a certain point in the late 20th century may remember a show called Why Don’t You Just Switch Off Your Television Set and Go Out and Do Something Less Boring Instead. So does Gauntlett. I wondered at times whether this shift is over-stated in the book. Or at least that I we should be careful of putting them up against each other in terms of making. I love the passivity of some TV shows because they free me to knit in front of them (just knitting on its own doesn’t catch my attention enough). Or what about TV shows that draw on crafting cultures? (food TV, especially in the USA is fascinating here). Moreover, there are ways in which that big smooth professionally oiled machine of big media acts as a material for 21st century craft. One of the striking, not always appreciated, aspects of 21st century making is how much of it is re-making. Fan fiction is the classic case study of the complexity of such remaking culture. Take, for example, Constance Penley’s book NASA/Trek where she writes about people re-working the stories of Star Trek just as they also rework the various stories surrounding NASA. A smaller topic, but equally interesting I thought, was that of mess. Gauntlett mentions this first when he is introducing web the notion of web2.0 and mentions a video from Chris Anderson, and then comes back to later when discussing the Jaron Lanier’s book You Are Not a Gadget. It reminded me of my friend Felix’s great idea (a few years back now) of ‘messy Tuesdays’. Inspired by the ways in which some knitting and cooking bloggers seemed to be self-consciously styling their domestic lives to look like a glossy lifestyle magazine, Felix wrote up a manifesto (currently offline): ‘You are not your flawless surfaces. You are not your orderly laundry-pile. You are not the seamlessness of your Finished Objects. You are not your risen cakes. You are not your sewn-in ends’. As another blogger, Lara put it, ‘as someone who spent her teenager years wrapped in teenage angst about not being clever enough, pretty enough or thin enough, the idea that my home won’t be beautiful enough, my craft not so well executed or my knitting up to speed has been at times quite tough’. They confidently posted about the less tidied-up bits of their lives, celebrating the beauty and reality of the mess that surrounds us all. I sometimes think we should bring that back: #messytues has something on a twitter meme about it, no? I also think there’s potential for some research here. John Law is good on this topic, as a post on the ‘serendipity engine’ reminded me recently. Although I’ve just quoted a couple of knit-bloggers, I think this idea of the reality, necessity and even beauty of mess has something to say about the way we tell science stories too (as the reference to Law may signal). The point that most interested me about this book, however, was the way that Gauntlett, as a professor of media studies, is interested in people making media and mediating making. It’s all very popular culture orientated, with some nods to domestic life. The hand crafting of pharmaceuticals, for example, doesn’t get much of a look in. I wondered if this would have brought something else to the debate. That’s one of the reasons why I referred to NASA/Trek. There are many other better works on fanfiction (e.g.) but I think Penley’s discussion of something as intrinsically ‘big science’ as the space race says something about the social arrangement of makers in late modern society. There is a danger that by focusing on the ways people make and remake some objects we further ‘black-box’ others. For example, I learnt how to knit from reading knit blogs. I can make a jumper. I can also blog about this on the super clever iPhone I carry around with me. I don’t know how to make an iPhone though, or even spin my own wool to make that jumper from. The latter is largely a matter of choice (I do at least know some blogs that’d teach me to spin and even what plants to grow to make my own dyes from, as well as a few people who have access to sheep for wool, or possibly even a llama). For the former though, I have no clue where to even start teaching myself, even if I did, the manufacture of an iphone is not exactly opensource. Most of the time, I’m ok with that cluelessness, it frees me up to be knowledgeable about other things, but it does also disempower me. There are key ways in which most of us do not have the means to (media) production – from our inability to understand how to do anything but use (as in use as a consumer) the shiny computers so many of us carry around in our pockets, to more economic or legal issues like the one Martin Robbins recently flagged up on his post about web hosts as the Achilles heel of online journalism. None of that is necessarily a criticism of the book. We all have to focus somewhere, and Gauntlett does touch on these issues a bit in his final chapter ‘Web 2.0 – not all rosy?’ Still, I was surprised not to see more on the sociologies of work, expertise and technology and finished the book wanting to hear more about anti-social aspects of DIY culture. I also suspect Gauntlett would get an intellectual kick out of the various aesthetics of steampunk maker culture (old post I wrote on an exhibition of such work). To conclude, I do want to stress that Making is Connecting is a lovely book, not least because of Gauntlett realistically optimistic approach. Though he’ll happily call ‘rubbish!’ (his 10 things wrong with the media ‘effects’ model is justifiably a classic), he doesn’t wear an ability to be ‘critical’ like it’s some sort of pin badge to show membership of the ‘very clever thinkers club’. Academics should be able to say they like things, and I like this book. I’ll end on a positive note, an honest one, and say if you are a maker of any sort, I can wholehearted recommend Making is Connecting. It’ll give you a chance to think about the history and philosophies of crafting cultures. It’ll lift you out of your own maker microculture to help you ponder your wider context. It inspired me to make this post, and others, and to think more about my making. So do read it, even if it does take you a few months to get around to finishing it because you keep putting it down to do something else instead. This entry was posted in blogging, books, knitting, media, media studies, sociology, technology, television, web and tagged blogging, books, knitting, media, media studies, sociology, technology, television, web on May 18, 2011 by alice.